Nice ride, That would be one of the last ones with the seatstay caps. My 1992 had stays mitered to the lug and no caps. To add to this, the 4 digit serial number scheme went to 5 digit in the early 1990s, but in any case it is pretty easy to figure out which decade they fall into based on frame features. I am not sure they had serial numbers as early as 1974. He started around 74/75. 1970s bikes are very rare, early 1980s are not common. By the late 1980s the numbers were much larger and there were more members of the frame building team (however they were all still brazed by the master on the main joints), it's probably just that someone else was mitering, someone lug prepping, someone brazing on the braze-ons, stuff like that. The early ones have a different feel, you can see they are one mans work of art. While the quality of the bikes has always been exceptional they have a more mass produced look about them by the late 1980s, not that there is anything wrong with that! I heard (on good authority) that when the production numbers went up (not sure what year), the building of the frames was contracted out to others. I'm sure Marinoni did the custom stuff himself, but from what I heard, the stock stuff was done by others. Would like some actual citing on that. AFAIK Marinoni did all his own frames that were steel right up till 1998. I don't doubt that the aluminum and carbon production was done by other individuals and possibly other contractors. I visited a vintage bike collector on the outskirts of Mtl a month ago when I went to Terrebonne to pick up my newly painted Marinoni. He had quite a few nice bikes (Marinoni's too, old and 40th ann.) as well as some vintage parts, NOS Columbus tubing etc.... awesome stuff...anyways, he was the one who told me as he's been an acquaintance of Marinoni for a while. He also mentioned to me that since he had so much NOS Columbus tubing as well as NOS Campy dropouts, that he was supplying Marinoni with some of the tubing/dropouts to build his 40th frames....he got an almost 'free' 40th out of it...which I got a chance to ride. Its second hand info...and I didn't want to believe it but considering the #'s that were being produced in the 80s and 90s, makes sense. Apparently, numbers peaked around 2000 units per year. I assume that was after 1998. Numbers in the 1980s were below 1000 a year. If there was an assembly team with Giuseppe doing just the main frame brazing, then it I think it is easily possible he put a torch to every frame till 1998. There was an old site on the internet which I believe contained this information. I can't find it anymore and that was years ago that I last saw it. I think it was a web page from around 2000. Marinoni is up front about outsourcing the carbon, I wouldn't be surprised if other hands did the alumina as well, but there were not much other than steel Marinoni's prior to 1998, though many were TIG welded by that time. I have owned a variety of Marinoni's including frames built in 1979, 1981, 1988, 1989, 1992 and 1995. Quality was excellent on all frames. I think "best" is subjective. From my perspective as a collector I would be careful and say that the Marinoni frames of greatest artisan quality were produced from the beginning till the mid 1980s. One might define best as the intersection of experience and artistic expression and conclude the best frames were from the early 1980s. I do not disagree with that sentiment. The 1988 fleur-de-lis I had was a little less flashy (and not my size or I would still have it), but the work was equally clean. I now only have a 1981 Pista Special. My partner has a sport touring type of bike from the early 2000s made for her from Zona, and it is a fantastic all around bicycle. Great looking Marinoni OP, I love the old school Dura Ace parts.Great thread! This thread inspired me to join the forum and post about my two Marinonis (love these bikes). 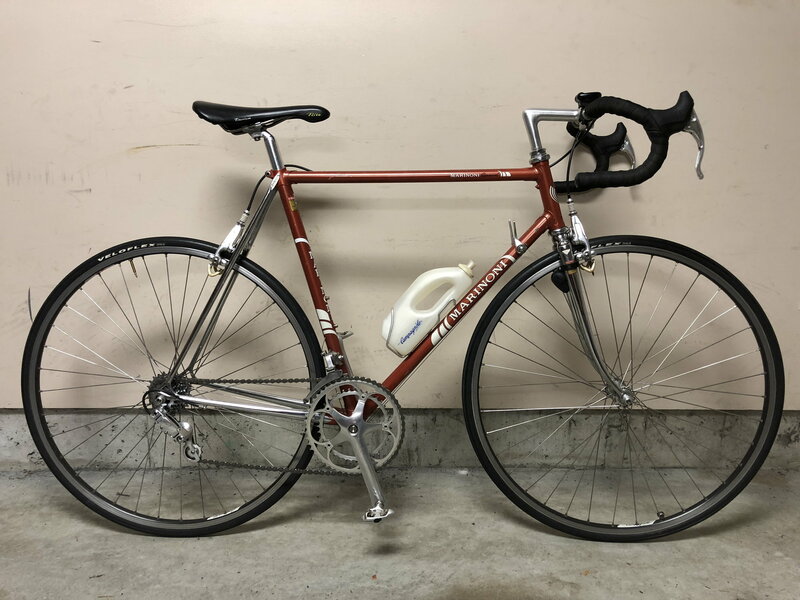 I ordered my first Marinoni as a custom in 1990 from a bike shop in Calgary (a 'Special'). I had some of the C-Record parts and some campy tubular rims with Chorus hubs I bought from a friend. I also purchased my friends Chorus brake calipers c/w C-Record levers. Purists may not like the Shimano Sante 7 speed freewheel (kind of blends into the background I think). The mid 90s Record post was picked up a couple years ago. 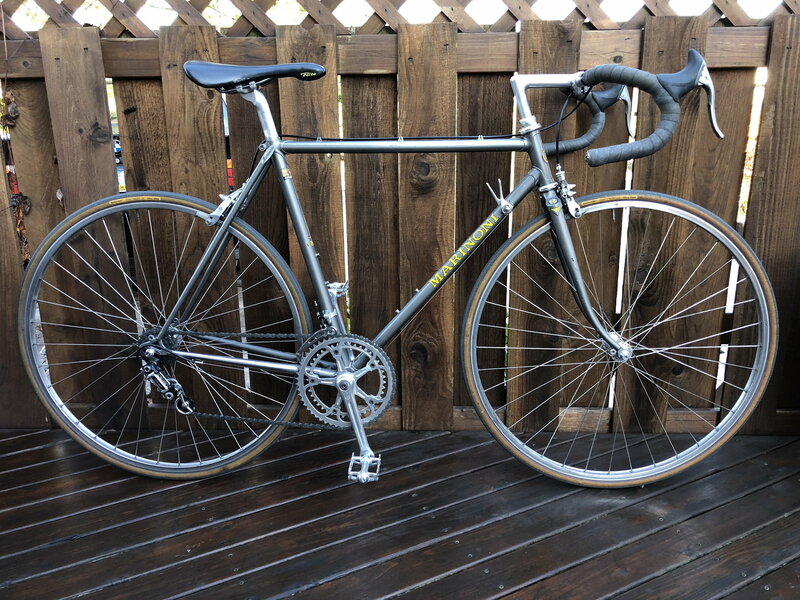 I had the Chorus hubs re-laced to Campagnolo Omega Clinchers in the late 90s (tubulars were too much trouble)My latest splurge is the purchase of 4th gen five pivot Delta brakes. I've always loved the way these look but could never justify the cost back in 1990. I payed through the nose last month on ebay to get a pair but do not regret a thing. Added modern CoolStop Delta compatible pads (kept the original campy pads). I had read that Deltas were not good stoppers but set up correctly they work as well as any rim brake I've ever used (love them). I then sourced some NOS black hoods (the white originals just didn't go with the bike). Welcome aboard, good reboot of this zombie thread, we love Marinoni's here. If somebody is itching for a red Marinoni complete bike, over at Bikeworks one has been on the sales floor for a while 60cm sizing, good price, gorgeous. Thanks for mentioning that one. It’s actually 62cm with Campy 10-speed that @RiddleOfSteel and I recabled (yes, all new proper Campy cables and housings) and cleaned up.